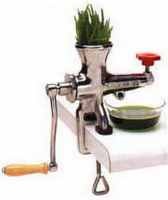 Make great wheat grass juice, berry juice, or peanut butter in minutes. Stainless steel augers adjust for maximum pressure and the unit completely disassembles for easy cleaning. Includes screen, funnel and plunger. 5-year manufacturer's warranty.